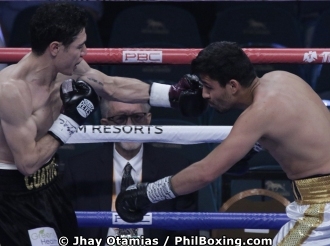 LAS VEGAS – Hugo 'Cuatito' Ruiz of Mexico dominated late replacement Alberto Guerrero sending his fellow Mexican to the canvas in the first round before winning by wide unanimous decision by scores 100-89, 99-90 and 99-90 in their 10 round featherweight on the undercard of the Manny Pacquiao vs Andrien Broner megafight at the MGM Grand Garden Arena here Saturday night. Ruiz was tabbed to challenge Jhack Tepora of the Philippines for Tepora's WBA Interim featherweight title but the Filipino failed to make weight during Friday's weighin coming over a whopping 5.5 lbs after which the WBA decided to drop Tepora in the card. Guerrero, a two-time world title challenger was called in to face Ruiz instead to open up the Showtime pay-per-view telecast. Ruiz controlled the fight the whole night throwing 517 punches landing 18% of it while Guevarra only thew 207 punches but landing a good percentage at 30%. Ruiz, a former WBC world bantamweight champion, improved his record to 38-4-0 with 31 KOs) while Guevarra dropped to 27-4-0, 12KOs.